I'm really not all that big on reading, yet this book attracted me. The lore of the game expands and you have a deeper understanding of cultures within the game. This book is entertaining for every Guildwars 2 player. A must. A gamers bible as it were. After reading a good portion of the book, I re-enter the world with a fresh look and better understanding of the reactions and general culture and history within the game. I've been gifted all three books and will read them all. It goes at a snails pace, yet it's very entertaining and pretty exiting. Never thought a book could get me that exited. I keep wanting to read more. 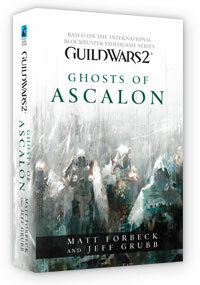 The story of the first book ( Ghosts of Ascalon. ) has an iron grip on me. I feel very at home within the Guildwars 2 world in the book. When they talk of cities, it's like your actually there. I can easily visualise the story that they tell; wich is also the main reason I love this book so far. Anyway. If you are one of those Guildwars 2 players that has not yet read one of these books. Then you should. Take it from a gamer that never read for own entertainment haha. These books are good, if you are a Guildwars 2 player, than this will make you better appreciate the game and the story around the whole game in general. Now. I'm off to the big world! The wonderfull world of Sass!